One upon a time I wrote frequently on the issues of food trucks in Sacramento. I got interested in the food truck movement after attending one of the very first Off the Grid events in San Francisco back in 2010. It was after that that I joined forces with a couple of partners to create SactoMoFo and stage the first food truck festival in Sacramento. That seems so long ago. 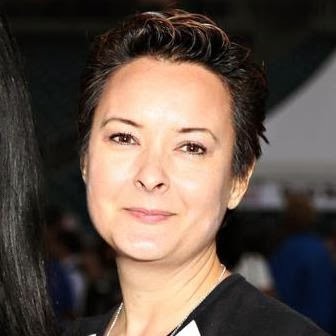 At the time I had met the Off the Grid founder, Matt Cohen, and had often asked him advice in those early years as we tried to get food truck ordinances passed here. He had told me that some day he hoped to bring Off the Grid to Sacramento. Well, that day is here. Off the Grid (OtG) is the most respected food truck organization in the country and Matt Cohen is one of the most important food truck advocates. OtG doesn't just accept any truck. Trucks must audition. That is, they must have their food tasted and their trucks inspected. If they aren't up to OtG's high standards, they are given advice to improve their business. Not all truck owners are willing to accept such advice as they can be stubborn. There are plenty of other trucks that welcome OtG's advice. It all started in 2010 at Fort Mason in San Francisco. 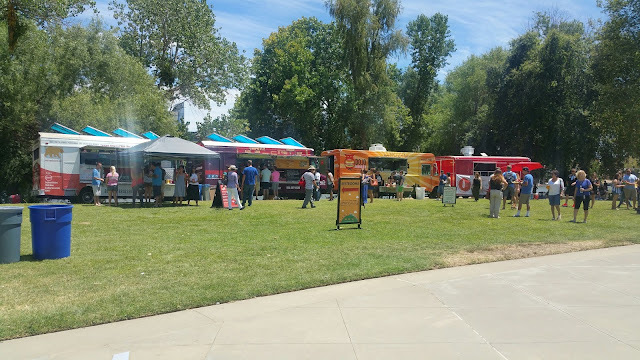 Since that time OtG has increased to food truck events in over 20 cities throughout the Bay Area. This month they arrived in (West) Sacramento with weekly events on the West Sacramento Riverwalk, across from Old Sacramento. The location is a nice one because there is lots of public parking (streets and a parking garage), park toilets, green grass, and, of course, the river with a nice Delta breeze on a good day. Crocker Park will be the site for Tuesday nights starting on July 12th. 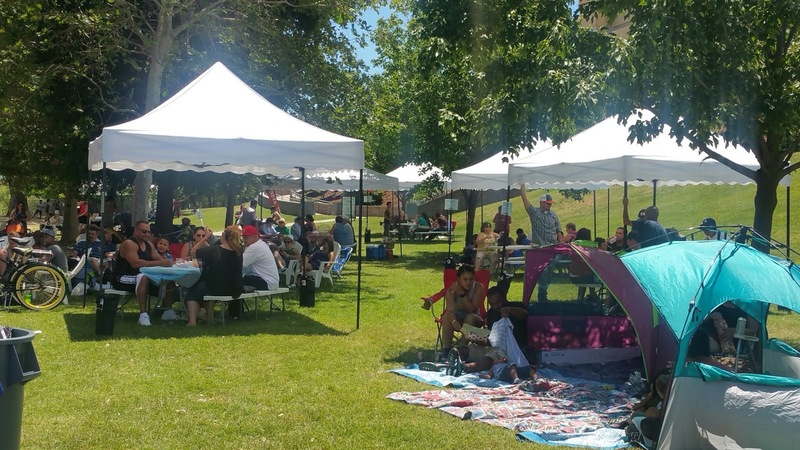 Sacramento weather is a lot hotter than the Bay Area and so one nice addition to OtG events here is the ability to rent sun shades and party tents. Sun shades create just enough shade for 2-3 people and come with 2 Adirondack chairs for $75. Party tents are the pop-up tents, come with a picnic table, and run $100. 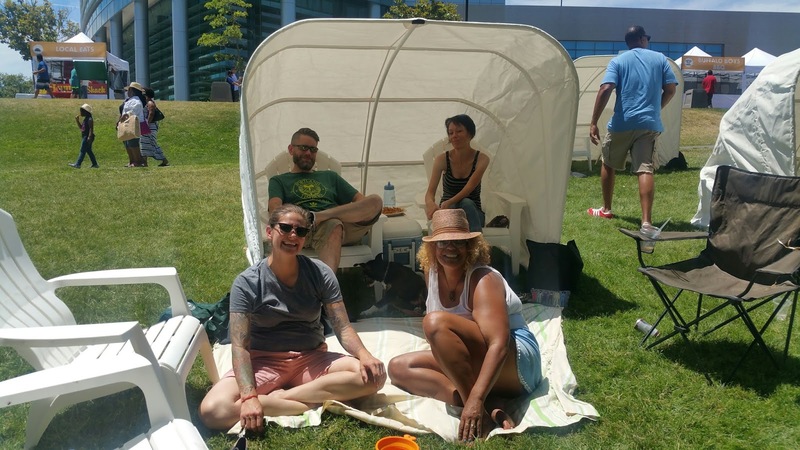 Personally, I would recommend the extra $25 for the tent as it will provide shade for a lot more people and allow breezes through. We had a cabana and while the shade is nice, it blocked off the cooling breeze. For the next couple of weeks, both are on sale at 50% off with code HEYSACRAMENTO until July 10th. You can reserve them here. There's plenty of food, of course. Half the vendors are trucks and half are tent vendors. Each week the vendors will be different. They are looking into rotating in a truck or two from the Bay Area to give us trucks we don't regularly see. There is also beer and cocktails available from two bars and music provided by a DJ. I know most of the truck vendors and definitely have my favorites. Everyone knows favorites such as Chando's Tacos and the Culinerdy Cruzer. If you are a Reuben sandwich lover, you HAVE to get one from Cali Love. Honestly the best Reuben I've had in Sacramento. 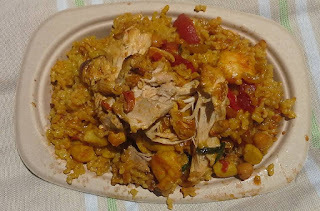 I wanted to try something new and so I chose the paella from Gerard's Paella. While this picture is not the most attractive, it was a heaping big plate of paella with lots of chicken, shrimp, and baby scallops in it. It was very popular as I saw many plates of it. I also had a Fat Face popsicle. Jaymes has been around for some time, but it had been ages since I'd had one of his popsicles. My friend had a delicious strawberry coconut one, but we agreed my kaffir lime avocado was the winner. It also happens to be one the most popular. It's a great way to spend a Sunday, enjoying sun, friends, and food. It's like having a picnic without having to worry about bringing the food. Off the Grid is every Sunday from 11a - 4p. Passion Fruit Curd done in the microwave!